Rye Barcott (back to camera, right) along a corridor in Kibera's busy D.C. village. Barcott, along with two Kibera friends, founded Carolina for Kibera, a nonprofit that in July celebrated its 10th anniversary of intertribal soccer, female empowerment, trash collection, reproductive health education, and community medicine. NAIROBI, Kenya — From nearly anywhere in this teeming capital city of Kenya, you can see its greatest embarrassment: Kibera, a 1.5-square-mile slum of steel-roof shanties and narrow, undulant alleys of mud, dust, litter, and open sewage. It’s Africa’s largest informal urban settlement, home to upwards of a million people. Most residents live there on less than $2 a day. But Kibera’s 13 informal villages are also places of vitality, color, and enterprise. A Harvard Business School case study, revised last year and being taught in a November class, captures the slum’s incongruent poverty and vigor. People find ways to scramble through Kibera’s fragile economy. Roadsides are vibrant workshops, cooking areas, and retail space. Tailors perch outside at pedal-powered sewing machines, women cook cakes of wheat and maize over open fires, bead workers assemble art, and young men crouch over arc welders, making metal work in a blaze of sparks. More than enterprise is incongruent about Kibera. At one edge of it stand the French embassy and the house of a former Kenyan president. From inside the slum, you can see distant busy roadways glittering with traffic along Kibera’s bowl-like edges. Across a road is Nairobi National Park, a small game reserve where tourists and schoolchildren can glimpse iconic wild Africa. Kibera represents another iconic Africa — a concentration of urban poverty that most Nairobi residents would rather forget, deny, or at least never visit. “I’ve never been there,” said one cab driver with a shake of his head. It was to this isolated, ignored Kibera that Rye Barcott, M.B.A./M.P.A. ’09, first traveled in the summer of 2000. He was a 20-year-old student with a smattering of Swahili, in search of both adventure and information for a thesis project at the University of North Carolina. By the next summer, Barcott had moved his sights from adventure to empathy. He had acquired a bedrock insight: that among the poor talent is universal, but opportunity is not. 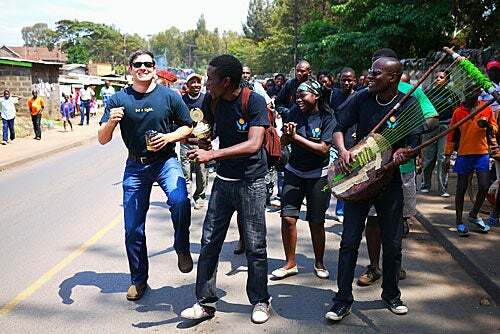 Rye Barcott (left) at the lead of the 10-year anniversary celebration parade in Kibera. CFK was the rest of the story, including its humble beginnings, its ascendant history, and its present challenges. The nonprofit is also the core subject of the Kibera case study being taught Nov. 9 by Amy J.C. Cuddy, an assistant professor at HBS. Barcott will be in class that day. Legalizing marijuana is one of very few “issues in America today where the voters are more enlightened than the elected officials,” said U.S. Rep. Barney Frank, who was invited to campus by the HLS American Constitution Society, where he addressed a packed crowd of law students in Pound Hall.